What a great whoosh of hot air to jumpstart this cool, gray, damp Seattle Monday! [The] news media has a nifty new way of “reporting” entertainment news: regurgitating celebrity tweets. It wasn’t that long ago that a celebrity with something “important” to put out there, like an apology, would automatically say it through a tightly controlled protocol, like a set of engineered sound bites delivered via a well-staged interview. Now 140 characters or fewer suffices. Had you confined your treatise to celebrity media, culture and publicity, it’s unlikely that I would have seen your column. (I rarely read AdAge.) However, the Twitter tease meant it showed up in my tweetstream. (Link bait?) And the sweeping generalization in the headline then demanded a reply. I’d argue that celebrity “press releases” (publicity) are as different from business “press releases” as The National Inquirer is from The New York Times or People/Us magazines are from The Economist/The Atlantic. I’d also argue that the “press release” blast — an untargeted communication not unlike the products of the mass media on the receiving end of those releases — began its decline with the popularization of the fax machine. Next, your use of the pejorative, “spin,” implies that press releases — or tweets — are inherently nefarious, deceptive, suspect. Legend has it that early PR man Ivy Ledbetter Lee issued the very first press release in 1906 on behalf of the Pennsylvania Railroad, after a derailed train plunged into a creek in Atlantic City, resulting in 53 passenger deaths; The New York Times printed it verbatim. If the same thing happened today, we’d all be looking for @nytimes to RT @PennsylvaniaRR’s real-time spin. Any corporate, celebrity, political or government communication — press releases, tweets and Facebook pages/updates, press conferences or interviews with muckety-muck execs — could be engineered with deflection or deception in mind. Technology is agnostic. Motives lie with people. What press releases — or blog posts — can do is provide an accessible back story that cannot or will not be included in a 30-second TV news story or a six-column-inch news story. One thing tweets do well is provide a link to more detailed information: the press release, whether its form is a classic release or the modern blog post. Heck, remember that this is how I found your column. The fact that the AdAge tweet led me to it doesn’t diminish the importance of the column; it’s just a new way of discovery. Moreover, the railroad anecdote reinforces my first point: there is a vast difference between the vapidness of celebrity culture and true news events that affect lives, livelihoods and liberty. There is also a vast difference between the journalists who report on these multi-faceted aspects of life and those who hound celebrities. Thus, I would not expect the New York Times to blindly retweet statements from the Pennsylvania railroad. If you have examples of this happening during the BP crisis, please, do share the URLs. AdAge sparked a flurry on Twitter Monday with a juicy essay, RIP, the Press Release (1906-2010) — and Long Live the Tweet, by @SimonDumenco. [T]o quote Simon, “as the celebrity-industrial complex goes, so goes the rest of corporate America.” Forget that publicity firms are the last firms to social media, often being beat (by years) by their consumer technology sister firms. Forget that publicity and the entertainment complex aren’t comparable to corporations that have to abide by SEC disclosures and other sticky things like that. But, maybe, just maybe Twitter’s limitation to 140 characters is just not enough to disseminate news, even with links to a blog or page that is, well, I guess it’d be a press release huh? It’s up to PR folks to help reporters and consumers that are wading through the static to direct them to clearer channels. The press release helps to do that. In the last two weeks, I have written a handful of releases. Their distribution was enhanced by Twitter and Facebook. With all due respect, Simon, publishing an article about the death of the Press Release in Ad Age is ironic. I believe this is part of the problem and disconnect. Publicity is not PR and vice versa. Of course Twitter (and other social media) plays an important role for popular and breaking news and is helping evolve new communications mediums. But as others have noted, it’s is not all about celebrities and earthquakes. Press releases aren’t dead, so let’s try to be a bit less argumentative and bit more informed, shall we? If not, I’ll have to keep saying that advertising is dead. Which of course it is. I’d rather read one coherent 250-word news release from a real source than a bunch of disjointed tweets. But then, writing a 140-character tweet doesn’t take much heavy thinking. Dear Stan, it is far more challenging to craft a meaningful 140-character tweet. It is almost without exception that it takes more effort to squeeze meaningful content into a small package, be that a speech or a tweet. [T]he press release has evolved more in the last decade than it has over the century thanks to the proliferation of the Internet and most notably, the Social Web. Today, press releases are indexed by Google, distributed via Slideshare.net or Scribd.com, or refashioned as blog posts. They are promoted via Tweets, Facebook, MySpace, LinkedIn, email. The press release is not dead! As an exercise in personal branding and as an experiment, yesterday I decided to promote my post. Although WiredPen posts are syndicated to Twitter automagically, I’ve never actually tried to get readership. 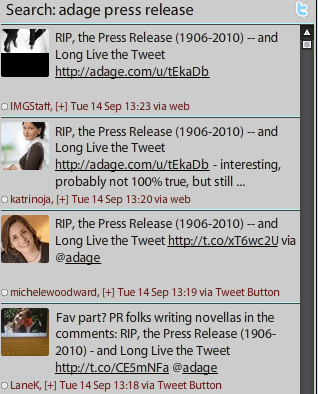 First, I set up a search in Tweetdeck for the keywords Adage Press Release. I looked for people who had done more than hit the RT button, people who had expressed an opinion about the essay. I then went to their Twitter page. If it looked like they were open to conversation (a quick judgment) and that they were fairly digitally savvy (based on Twitter bio), I then sent them a Tweet with my link. It was fun; it didn’t take too much time; and I discovered some interesting people to follow or add to my Twitter lists. This morning, Regan Communications asked for permission to publish my essay on their blog. This is icing on the cake, so to speak, amplification far beyond anything I might have set for a goal, had I been doing this with ROI in mind. There is another thing that Twitter is doing that should have editors, marketing folk and PR practitioners thinking about: Twitter is extending the life of a post. Discovery is a process that occurs across time, not just at the time of publication. This means that articles have the potential to have a longer life. Witness the AdAge remark about the RIP essay making it to the top five two days running. Would that have happened without Twitter? I doubt it. I love the post. Mind if I were mention it in my blog submit?
. @kegill your post is killer! @kegill Wonderful read and rebuttal to the AdAge piece. Well put Kathy. The press release is still valuable in that it allows organization/individuals to illustrate their actions/opinions. It is a lasting record that can be recalled and referenced by the subject and the public. Thanks so much for this great response to the Ad Age piece. I too did a blog post and was baffled by Mr. Dumenco’s brash attitude. As a PR person, I find the press release very helpful and still very valuable. The release has evolved and will continue to do so.